Off over 3000 apps that are available for the Apple Watch on the App Store, we are proud to share that Numerics is featured in Apple’s special lists of apps designed for the Apple Watch. Numerics is also enlisted in the “Great Apps & Games That Work with Apple Watch” list on the App Store home page for most countries where the Apple Watch is available, alongside many popular apps like Salesforce, Evernote and more. Apart from being featured by Apple, Jonny Evans of Computer World thinks Numerics is one of the 11-Must have Apple Watch apps that you must try. 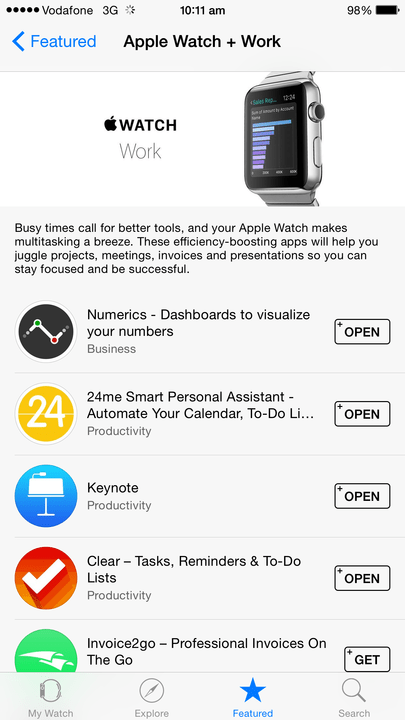 9to5Mac also likes Numerics and has added it to their list of the Best Apple Watch apps you can download now. We are incredibly excited with all the love and encouragement for Numerics for Apple Watch. This is just the beginning, we have some interesting ideas for Numerics for Apple Watch and we plan to get started on them as soon as our Apple Watches arrive. We would like to take this opportunity to invite you to try out the app and share your feedback with us. You can give us a shout out on Twitter or mail us and we’ll be in touch. Download Numerics for Apple Watch now or get more information about Numerics here.